3.9 out of 5 based on 66 bloggers and 8 commenters. 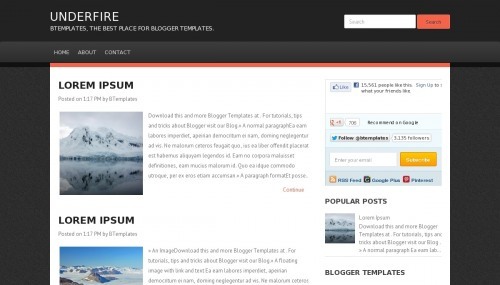 Underfire is a free blogger template adapted from WordPress with 2 columns, right sidebar, footer columns, slider, posts thumbnails and a background pattern. Why can’t I add a new page? Every time I add a new page, it will still link to the HOME PAGE. Makes people cannot access other pages. Can you please help fix this? vry vry nice and usefull site..
gd job nd nice tamplet..
i use this tamplet rely vey nice ..